The BIS chief bashes cryptos, wants to know why people are trying to create their own currency. The BIS says cryptos do not meet the requirements for currency. Payroll numbers come in and the unemployment rate moves up to 4%. Labor participation rate are at 1970 levels. More part time jobs were added as retail stores close down and layoff people. The real estate bubble has popped in Manhattan, prices are coming down and people are having a difficult time selling their place. Russia places penalties on the US. The yield curve inverts and the Fed decides to get rid of this type of data because it is misleading. The Fed pushes the agenda to remove all information that will show the Fed was responsible for the economy collapsing. New about if the FBI was lying to the American people is allegedly suppose to come out, will this happen? The European nations say that they will most likely come up with the an Iranian deal in Nov of this year. People of SK do not want the THAAD system in their country. NK is preparing for the next summit with the US. UN reports are very misleading in Syria, actually they don’t make sense. Syria has taken 70% of the southern area of Syria. The US, Russia and Israel are in talks about having the troops leave Syria. The OPCW has reported that no chemical weapons have been used in Duma. Judging by the level of animosity from Carstens, it seems clear that The BIS is very worried about the possible disruptive effects on their monopoly position from the cryptocurrency space. Cryptocurrencies do not fulfil any of the three purposes of money. They are neither a good means of payment, nor a good unit of account, nor are they suitable as a store of value. They fail dramatically on each of these counts.”Interesting…going by his definition of what constitutes good money, it seems that no existing FIAT currency fulfils the purpose of money. Look at the USD, it’s lost 98% of its value since 1913. Going further back, The April payrolls change was revised up from +159Kto +175K. With these revisions, employment gains in April and May combined were 37,000 more than previously reported. After revisions, job gains have averaged 211,000 per month over the last 3 months. June Jobs Increase: All Part-Time Workers As Full-Time Jobs Drop. In June, the number of part-time workers rose by 145K to 27.028MM, while the full-time workers declined by a modest 89K to 128.658MM. On a longer-term basis, however, this month’s jump in part-time workers appears to be an outlier, with the bulk of job additions in the past year manifesting in the form of full time jobs. The Manhattan real estate bubble appears to have just burst – as 54% of sales in the second quarter closed below asking price, according to Bloomberg. The lowball offers coincide with a significant 17% decline in sales vs. 2017 – resulting in the lowest second quarter tally since 2009.
that Russia’s additional duties will apply to imports of fiber optics, equipment for road construction, oil and gas industry, metal processing and mining, according to an economy ministry statement. Russia will be able to compensate for the remaining part in three years since the introduction of the U.S. duties or after approval of the WTO dispute settlement body if it finds the U.S. restrictions violating the organization’s rules, the ministry said. Fed revealed that instead of thinking about backing off rate hikes, it’s replacing the yield curve. The yield curve is formed by Treasury yields of different maturities: normally, the two-year yield is quite a bit lower than the 10-year yield. 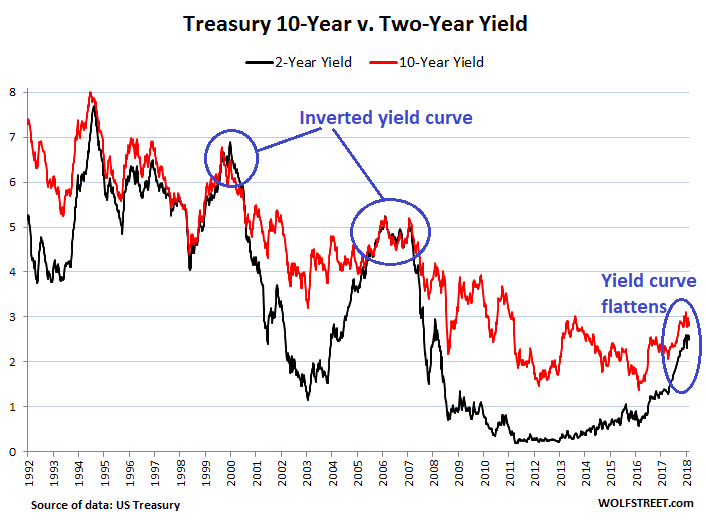 Over the last several decades, each time the yield curve “inverted” – when the two-year yield ended up higher than the 10-year yield – a recession followed. The last time, the Financial Crisis followed. So this has become a popular recession indicator that has cropped up a lot in the discussions of various Fed governors since last year. Today, the two-year yield closed at 2.55% and the 10-year yield at 2.84%. The spread between them was just 29 basis points, the lowest since before the Financial Crisis. Fed revealed that instead of thinking about backing off with its rate hikes, it’s throwing out the flattening yield curve. In other words, the Fed’s massive balance sheet, nine years of near-zero interest rate policy, and other factors might be distorting investors’ thinking. 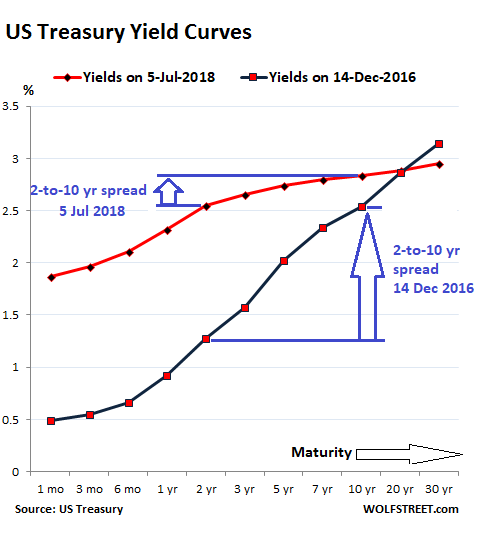 And this distorted thinking causes investors to pile into long-term Treasuries at these low yields, and thus push down these yields further. Hence, the “information content” of the yield curve – the signals of a coming recession – might be distorted. we have arrived at a crucial battle. A House resolution sets Friday as the deadline for the Justice Department to come clean on the beginning of its investigation into the Trump campaign. We’ll find out if the FBI has been lying to the public. At issue is the FBI’s “origin story,” in which it claims its full-fledged investigation into a presidential campaign was conducted, as it were, by the book. The story is full of holes, and they are widening. No one has explained why two months passed between the Papadopoulos-Downer conversation and the July 31 probe. We’ve learned that it wasn’t Australian intelligence that passed along the info, but Mr. Downer personally, to State Department personnel in violation of procedure. And a growing list of Trump officials now relate moments when they were approached by suspicious figures before July 31. That’s why congressional investigators have come to suspect the real origin story is very different. They believe the FBI was investigating Trump officials well before July 31, on the basis of the dossier and dubious information from State Department officials. They think the bureau was employing a variety of counterintelligence tools before there was an official counterintelligence probe—and that this included deploying spies against political actors. They suspect that only when the FBI decided that it wanted to obtain a Foreign Intelligence Surveillance Act warrant against Trump aide Carter Page (which requires an official investigation) did it surface the Downer information (collected back in May) and make it the official pretext in July. Just what will the deep state do to avoid this eventuality? Do they have anything left , will they use an event, create another news story that creates emotion to clog the news cycle?? Most likely this new will come out late today, pushed down to the bottom of the msm news cycle with other news or an event covering it up. The sources said North Korean diplomats have been sent to Bern, Davos and Geneva to obtain firsthand information about international conference halls and hotels that could be used for a bilateral summit and talks involving China and South Korea. The small South Korean farming village of Soseong-ri is hosting growing protests, as it has been playing host to THAAD missile defense systems set up there by the US. The locals are none too happy to have them there. This is a concern some locals have expressed since the THAAD were put there. The missile defense systems are potential high-value targets in the event of war, and it makes this small farming village a much bigger target than it normally would be. Resistance to the THAAD is growing. Locals now are also complaining that the US generators installed to power THAAD are noisy, and that there is a lot of military helicopter traffic in and around the area that is disrupting their once quiet lives. With peace progress being made with North Korea, there is also some sense that the THAAD, which President Moon never authorized the US to deploy in the first place, doesn’t need to be there. US officials are showing no inclination to remove them, however. Germany’s Foreign Minister Heiko Maas said on Friday the Europeans would not be able to fully compensate for companies leaving Iran due to new US sanctions. UN organizations claim high internal refugee numbers in southwest Syria due to recent fighting in Daraa governorate. A review of the evidence finds that these numbers are implausible. Over the last two weeks the long announced operation of the Syrian army and its allies to liberate southwest Syria from terrorist organization and ‘rebels’ proceeded well. The eastern part (red) of the ‘rebel’ held area has been recovered without much serious fighting. Most towns in the area accepted the Russian offers to reconcile with the Syrian government. The various local ‘rebel’ groups in those towns handed their heavy weapons to the Syrian army, joined the army or laid down their arms. Other fled further south. Those groups who resisted received a short but sharp lashing by the Russian airforce and Syrian artillery until they were convinced to give up or move out. Daraa (Syria) (AFP) – More than a quarter of a million people have fled a Russian-backed government onslaught on southern Syria, the United Nations said Monday, in the latest civilian exodus in the seven-year war. The violence has pushed waves of terrified civilians out of their homes at a shocking rate, the UN’s refugee agency (UNHCR) said Monday.”We were expecting the number of displaced in southern Syria to reach 200,000, but it has already exceeded 270,000 people in record time,” said UNHCR spokesman in Amman Mohammad Hawari. No further source for the claimed number of refugees was given. A report by the UN Office for the Coordination of Humanitarian Affairs (OCHA) published yesterday even speaks of up to 325,000 displaced persons. Where are those supposed to have come from? the UN report does not explain how, when or why 164,000-171,000 people supposedly moved the few miles towards the Israel occupied Golan Heights. There is no evidence that this claimed movement of IDPs, who may or may not exist, happened at all. The UN must stop to distribute such alarming numbers that evidently can not be backed up at all. Under the agreement, the FSA will hand over its weapons to the Syrian Arab Army (SAA) and withdraw to the opposition-held areas in northern Syria along with radical fighters of Hay’at Tahrir al-Sham (HTS) and the Ahrar al-Sham Movement. In return, the SAA will withdraw from the recently liberated towns of al-Musayfirah, al-Jizah, Kahil and Shawat al-Qamh. The SAA will be replaced by units of the Russian Military Police and later by the Syrian Police, in a similar way to what happened in the northern Homs countryside. The rebel forces have completely collapsed in eastern and southern Daraa, prompting the Syrian Arab Army (SAA) to sweep through a large amount of territory in the last few days. Backed by heavy airstrikes from the Russian Aerospace Forces, the Syrian Army has retaken several areas in the last 48 hours, forcing the rebels to fall back towards the provincial capital. As a result of these advances, the Syrian Army finds themselves in control of approximately 72 percent of southwest Syria. The remaining 28 percent is under the control of the Free Syrian Army/Hay’at Tahrir Al-Sham and Jaysh Khaled bin Walid (ISIS affiliate). The Syrian government has wanted to reopen the trade route between Amman and Damascus for years; however, the rebel control of the Nassib Crossing has made it difficult to do so. The Organization for the Prohibition of Chemical Weapons (OPCW) has announced in a report that it found that chlorine had been used in an attack in the Syrian city of Douma. However, there was no evidence that nerve agents had been used in the attack. At the same time, OPCW experts said they had found traces of organic substances containing chlorine, allegedly used in the attack in Duma. “Along with explosive residues, various chlorinated organic chemicals were found in samples from two sites, for which there is a full chain of custody,” the FFM said. The gas attack in Douma, which was filmed by the White Helmets last April, led to a series of airstrikes against Damascus, conducted by the US and its allies after Western countries accused the Syrian government of being behind the incident. Damascus denied the claims, calling them a “provocation.” Moscow subsequently found victims of the alleged attack, who claimed that they had been forced to participate in the footage of the “attack” in exchange for food. According to top decision makers based in Damascus, the US President Donald Trump is pushing his administration to approve an already prepared total withdrawal plan. Russian sources involved in the preparation of the Putin-Trump summit, expected this month in Europe, believe the Russian President can offer enough guarantees to the US president to leave the Levant before US gets caught into the Syrian-Iraqi quagmire. The deep state will try to stop the meeting between Trump and Putin, they will most likely push Russian aggression or something else. Labor participation rate is unemployment rate.